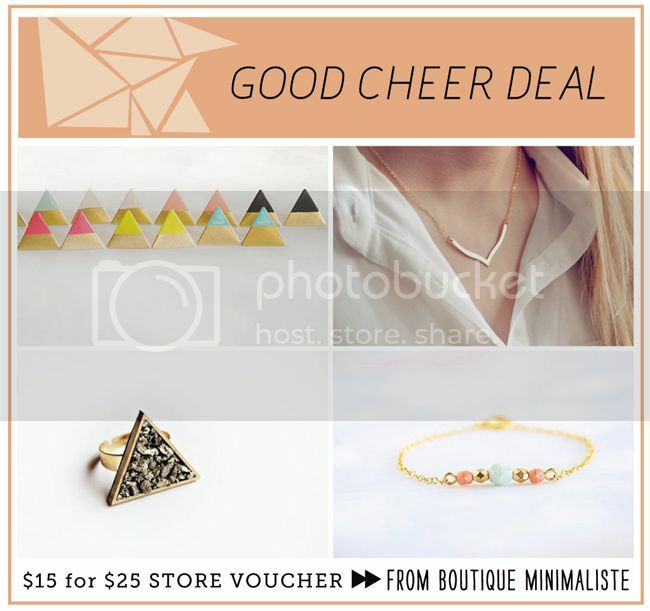 Today we have a sweet deal from the amazing shop: Boutique Minimaliste - I love all her necklaces, earrings, and bracelets - each piece is so delicate yet makes a bold statement at the same time... and the items are so reasonably priced too! You can choose from 2 voucher amounts - a $15 for $25 voucher or a $26 for $50 voucher! This is a great opportunity to get some Christmas gifts! Be sure to follow BM at their blog too! - Act now - 30 $25 and only 10 $50 vouchers available! When I go to checkout the only option at checkout is paypal, not other! Will they be sending out a shop coupon instead? sorry about that ladies! ill email them and in the mean time id try messaging them at etsy as well :) thanks for supporting! Can I enter this giveaway if I am not on facebook?